On Tuesday, the 19th, I had the pleasure of attending the Governor’s Luncheon. This year celebrated the 60th anniversary of the Arizona-Mexico Commission (AMC), a non-profit public/private partnership that seeks to foster the business, cultural, and political relationships between Mexico and Arizona. The other goal of this luncheon was to promote the “US Mexico Canada Agreement”, or USMCA, which is a proposed trade agreement that some refer to as “NAFTA 2.0”. Where NAFTA focused primarily on trade, the USMCA will take into account other things like labor regulations, gender equality, and indigenous peoples. This new trade agreement between President Trump, President Obrador, and Prime Minister Trudeau has already been reached, but it now faces the challenge of being passed by all three countries’ legislators. 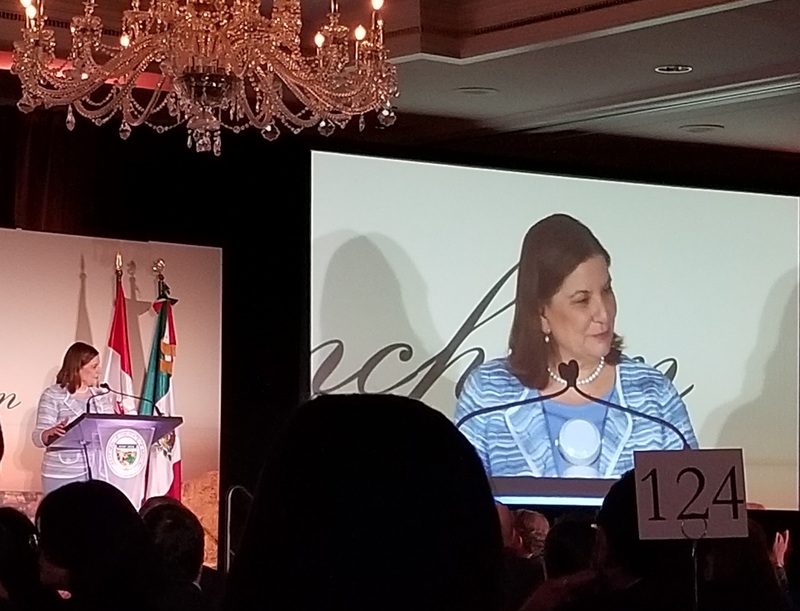 Governor Doug Ducey’s guest this year was none other than Her Excellency Martha Bárcena, ambassador of Mexico to the United States. Some of my fellow Campus Ambassador friends and I helped check guests in, and it was a surreal experience. There were so many diplomats, politicians, and high ranking business folk just chatting in the foyer like normal people. Prior to that day, I had never talked to a US senator before. I felt a little embarrassed after realizing I asked “Could I have your last name, please?” to Arizona Congresswoman Debbie Lesko. The conference room at The Camby hotel was packed with a couple hundred people. Camera crews from every major Arizona news station were lined up in the back, and wait staff hovered around dozens of tables refilling water glasses and carrying plates. Then a member from the AMC came on to the stage to introduce Governor Ducey. The Governor gave a well-polished speech about the importance of the Arizona-Mexico relationship. I was blown away by some of the trade stats between Mexico and the single state of Arizona. Over $16.7 billion were traded last year between the two partners! For context, the entire countries of the United States and Poland only traded around $15 billion. Governor Ducey emphasized Arizona’s leadership role among states in the US, and shared some of the special projects unique to the AZ-Mex border. For instance, the Unified Cargo Processing pilot program is a “consolidated joint customs inspection process.” The implementation of this program will allow the hundreds of thousands of trucks that cross the Arizona-Mexico border to streamline the customs process, which would have a multitude of benefits for multiple stakeholders. Mr. Ducey continued for a few more minutes about the future of AZ-Mex relations, and how he envisions the 7% growth rate in trade between these two neighbors to increase even further. He implored business leaders and diplomats to tell congress how important this new trade deal is. And personally, I really do think it’s important. Then it was Her Excellency Martha Bárcena’s turn. Madame Bárcena was a wonderful speaker who convinced me that she truly loves the people of Arizona – and not just because her brother and sister are now US citizens in this state. She was warm and personable, yet had an air of authority about her. The perfect blend for an ambassador, if you ask me. She was adamant that the USMCA be implemented. When she talked about speeding up the customs process, the tables next to mine – which were full of Mexican and American businesspeople from mining and agriculture – erupted into applause and shouts of approval. She informed us that if the bordering four US states and six Mexican states were one region, it would be the 4th largest GDP in the world. Therefore, improvements in efficiencies are absolutely vital to encourage the continued economic growth between the US and Mexico. Ambassador Bárcena then focused in on Arizona. In Arizona alone, over 90,000 jobs have been created by trade with Mexico. There are more than 100,000 businesses in Arizona that are owned by Mexicans or Mexican-Americans, with Latina women owning 54% of those. That’s a lot of jobs. She really brought home how important the Mexican people are for the US economy, and how many industries are supported by the Mexican-American labor force. 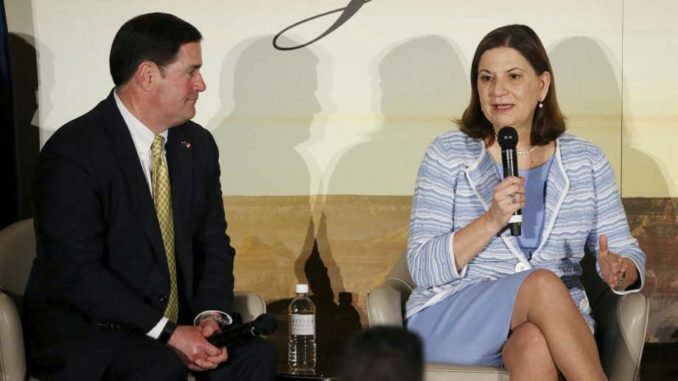 Governor Ducey and Her Excellency Bárcena were then invited to have a “fireside chat, sans fire.” They were given questions about labor, culture, and tourism. Those who attended the luncheon were able to write questions down for the Governor or Ambassador as well, and I was super excited when the Ambassador answered mine. I have always had an interest in diplomacy, but that moment rekindled the spark inside of me. Strong leadership is so important, and as the Ambassador’s post is a political one, it can have a profound effect on the business environment. It was really cool to be able to represent Thunderbird at this event, and I am very optimistic about the combined future of Arizona and Mexico. Remember to tell your local and state representatives how important the USMCA is!